This is a wonderful creamy ice cream recipe. And who can resist hot fudge? I like to make my own hot fudge, so there isn't any corn syrup in it. Dovetailing Tip: Use the leftover brownies from Meal 1. In a large saucepan over medium heat, add the half and half and heavy cream. Heat the dairy until it is steaming and barely starting to bubble. Meanwhile, whisk the egg yolks in a large bowl until they lighten in color. Slowly add in the sugar and whisk vigorously until the mixture thickens and falls from the whisk in a ribbon. Slowly whisk in about a cup of the dairy, a little at a time, to temper the egg yolks. Gradually whisk in the rest of the cream then transfer the mixture back to the saucepan. Set the pan back over medium heat and cook until the custard starts to thicken and coats the back of a spoon. Strain the custard through a fine mesh strainer and let cool at room temperature for 45 minutes. Stir in the vanilla and chill in the fridge for at least 4 hours or until the mixture is very cold. Churn according to your ice cream maker's directions. 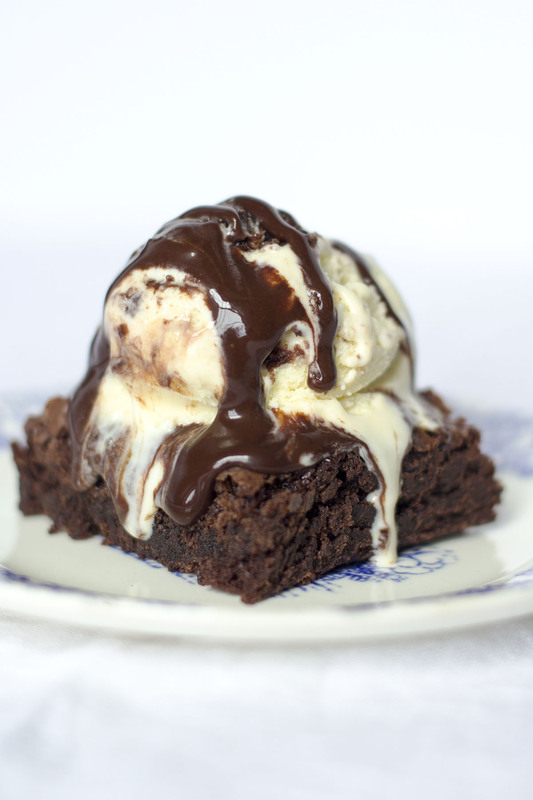 In the last 30 seconds of churn time, add in the brownie pieces. Move the ice cream to a freezer-safe container and swirl in the hot fudge. Freeze until firm and scoopable, about 4 hours or overnight.